How can you make $10,000? $10,000 can be a life-changing amount of money for many people, it could clear a debt, get a decent car, cover medical fees and more. 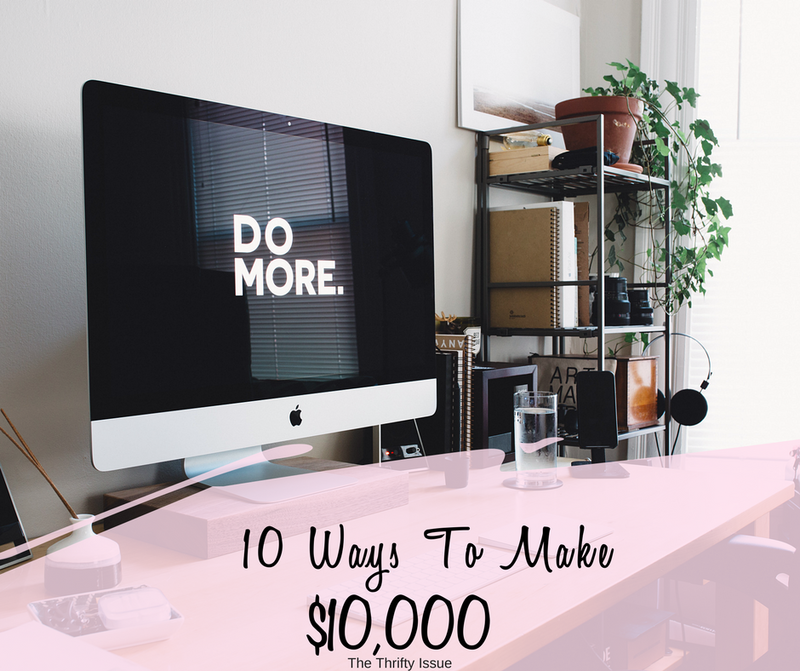 With a little bit of time, space or knowledge, there are multiple ways you can make $10,000. One thing to remember, you might not make the $10,000 in one hit but each of these options can make you $10,000 and if you put each bit of money you earn into savings or off your debt etc. 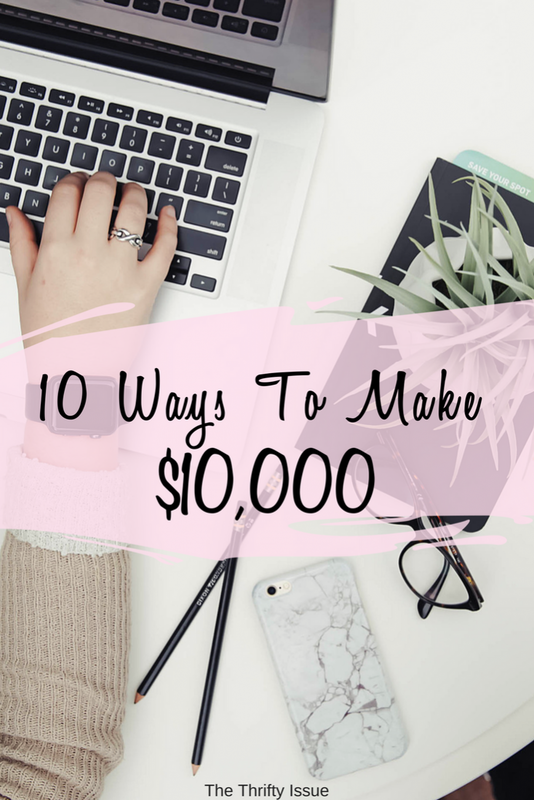 You will have that $10,000 before you know it! Disclosure, there are some affiliate links in this post. I am extremely selective about which products or services I recommend and only reference ones I personally use. The income from affiliates enables me to keep content on the site free, do cash giveaways for you and run the new Facebook group. Facebook or Gumtree have been the best places for me to resell items and I’ve made over $10,000 in a month doing it. I’ve done it for years so I know which products work well for me, how much things in the niches I sell in should cost me and how much I can sell them for. As a minimum, you could easily make $10,000 a year doing this, however, I have made $10,000 in a month and share how I do it in this guide. If you have a spare room you can rent it out. Depending on where you live and how you rent it, this could be $200 a week which equals an extra $10,400 a year. You could rent to a long term boarder or put it up on Airbnb which generally gets you a higher per night price. In my area, $100 to $200 a night is not uncommon. Where I used to live $70 to $140 was more common. For tips on renting out a room, check out this post. Or if you want to know how to make your mortgage pay for itself, read this post. It has become a more competitive market, however, I know many people making full-time incomes from freelance writing. Even if you only did one article a week at $200, that is $10,400 a year (realistically, if you have qualifications or extensive experience, $200 is low). If you want to do it, I recommend doing a course such as Earn More Writing (Holly is wonderful and has a super supportive Facebook group, too)or check out my post on how to be a freelance writer. Ironing, cleaning, mowing lawns, gardening, babysitting and doing other odd jobs usually nets between $20 and $50 per hour. Do 4 to 10 hours a week (depending on the hourly rate) and you have an extra $200 a week or $10,400 a year. You will need to take into account any tools, petrol and other expenses so may need to work an extra hour or so to cover that. Check out 51 ways to make money from home for more ideas and information on how to do it. This works best once you have an established blog or online presence. Affiliate marketing is where you recommend something or have a link to something and if people buy or sign up through your link, you get a payment. I am extremely selective with this and thus my affiliate income is lower than others. I know many people who make a lot of money recommending products or services which really aren’t the best (e.g. many bloggers recommend BlueHost for hosting and this is because they have a generous affiliate program. I, and many others, found BlueHost to be atrocious and switched to SiteGround. I have been blogging for almost 10 years on different sites and have used various hosts. SiteGround is by far the best if you want to blog). You can check out my tips on blogging here to get you started. If you choose to do affiliate marketing, be honest, be transparent and always disclose you use affiliate links! To see how much others make with affiliate marketing, check out Making Sense of Cents or Smart Passive Income (both bloggers I know). Become an Uber driver, do tasks on AirTasker, rent a room on Airbnb, rent your space or any other number of options through the share economy. These are side gigs with random income instead of regular income like a job, all these options can make you well over $10,000 a year though. Do an Etsy or Made It store, sell at markets or set up your own business through social media. Depending on what you sell, how much your profit margin is and how you market, you could make over $10,000 a year with this. You can create graphics, blog themes, jewellery, cushions, clothing or anything else you like. Your income will be higher the better you are at marketing your products too. Are you a graphic designer, writer, social media manager, great with admin or have any other services you can sell? Whether you do these services full or part time as a business or for a hobby, they can be extremely lucrative, especially as you grow your reputation and can start outsourcing which will allow you to take on more clients and make more money. Check out how to become a virtual assistant for some ideas on options. I tested this out at the end of 2017 and early 2018. I was paid $4,050 for the one I was involved in and could have done more that year if I wanted. Prices for trials range from $500 to $10,000 from what I have seen. Find out more about that here. Teaching can be done online or in person. Check your local community college, start a Meetup group and host events or set up an online course through a site such as Udemy (I have taken a few courses in topics I am interested in on Udemy). Teach whatever you have the knowledge and interest in. You’d be surprised what people will pay to learn about. What do you do to make money? What would you do with an extra $10,000? You might also like 43 ways for single mums to make money and 19 ways to make money in 2019.